Moscow, October 13, – The decision made by the Synod of the Patriarchate of Constantinople on the Ukrainian Church forces the Russian Orthodox Church to end its unity with the Ecumenical Patriarchate, Metropolitan Hilarion, the Chairman of the Moscow Patriarchate Department for External Church Relations, said. “The Patriarch of Constantinople has recognized the leaders of the schism, thus legitimatizing the schism that existed for over quarter of a century, and therefore has made it impossible for us to stay united with the Patriarchate of Constantinople,” Metropolitan Hilarion said in a program aired by the television channel Rossiya 24 on Saturday. The Russian Orthodox Church “will have to take measures,” he said. “Of course, we will be discussing them at the Synod; I’d rather not get ahead of Synodic decisions but we have suspended prayer communication and remembrance of the Patriarch of Constantinople in our prayers. 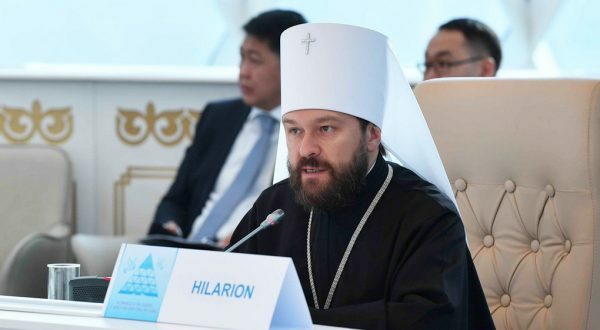 I believe that the decisions of our Synod will meet church canons,” Metropolitan Hilarion said. It was announced at an urgent meeting of the Synod in Moscow on September 14 that the Russian Orthodox Church will sever its full communion with Constantinople if the latter carries on uncanonical actions in Ukraine. Nevertheless, on October 11 the Synod of Constantinople reinstated leaders of the Ukrainian schism in their rank, ceased its own document issued in 1686 on the transfer of the Kiev Metropolia to Moscow and announced the creation of its stauropegion in Kiev. “I cannot describe the actions of Patriarch Bartholomew as anything other than predatory; it is clear to us that they will lead to the schism of the Orthodox World. The situation can be cured only if he or any of his successors step back from those encroachments and claims for foreign canonical territory,” he said.